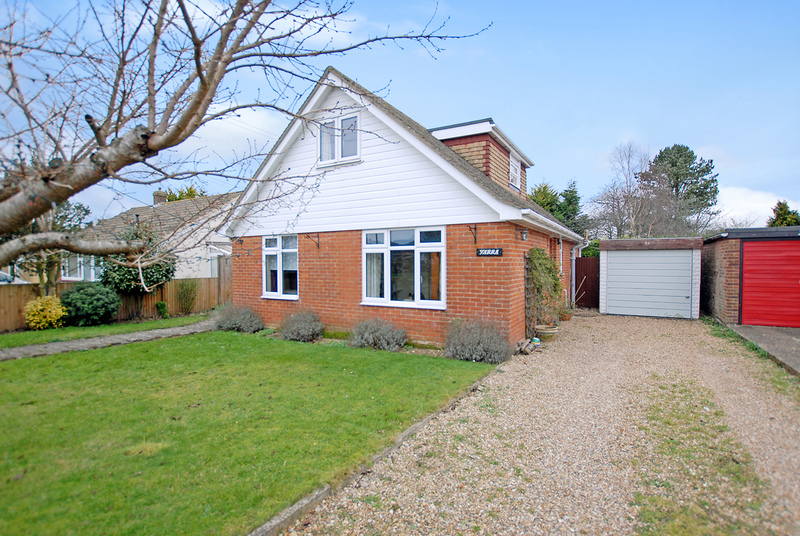 The property is situated on a peaceful and well regarded cul-de-sac close to the centre of the popular village of Lympne with its newsagent/post office, church, village hall and pub. There is a popular village primary school and bus stops nearby provide easy access to secondary schools in Folkestone and Hythe. This deceptively spacious detached chalet house has been considerably improved over the years, resulting in light and airy, generous living accommodation which has been designed to compliment a modern lifestyle and offers a great deal of versatility. The house is smartly presented throughout in an attractive contemporary style. The accommodation includes an entrance hall, sitting/dining room with sliding doors leading to the rear garden, smartly fitted kitchen/breakfast room which is partly set beneath a vaulted ceiling and is flooded with light from two Velux roof lights. There are also two bedrooms on the ground floor and a modern shower room. The first floor comprises two further bedrooms and a family bathroom. There is ample parking and a detached garage. To the rear of the house is a delightfully secluded, manageable garden and is a particularly pleasant environment in which to relax and dine alfresco.